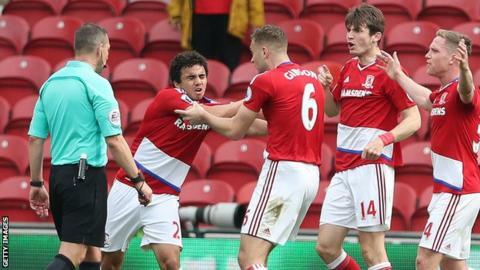 Middlesbrough have been charged with failing to control their players in Sunday's Premier League match against Manchester City at the Riverside. The Football Association charge relates to an incident around the 66th minute of the 2-2 draw when City were awarded a penalty. The club "failed to ensure that its players conducted themselves in an orderly fashion", the FA allege. Middlesbrough have until 18:00 BST on 5 May to respond to the charge. Referee Kevin Friend awarded City a penalty for Marten de Roon's challenge on Leroy Sane. Boro players were furious at the decision, with De Roon and Fabio booked for dissent.